as his companion tries to figure out how the reel works. 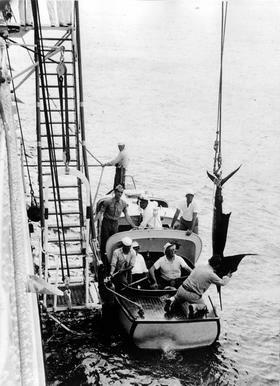 They are fishing for tarpon in the Gulf of Mexico in 1937.
word, it's him) as his sailfish is hoisted up. The story of how he caught a sailfish without hooking it. On August 27, 1938, the fishing president addressed the media about a fishing trip to Cocos Island where he landed a 100-pound sailfish -- yes, without a hook. "We were out fishing, trolling for sailfish," he recalled. "One of them took my line, which was out about 200 feet beyond the boat with a hook and feather on the end. ﻿﻿"He jumped in the air and, apparently, while he was on the end, another sailfish came along and got his beak all snarled up in the line. The fish that got caught on the hook got away, but the fish that got caught on his nose was hauled in." 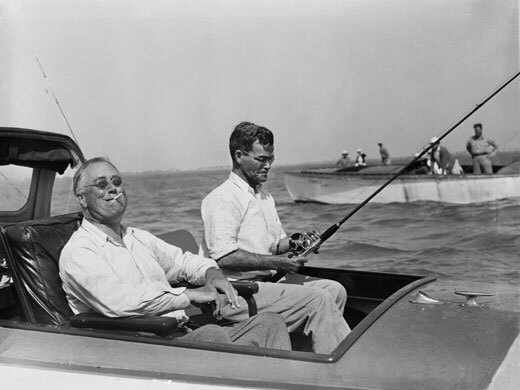 FDR told the press that there were 11 witnesses on the boat and someone with "a moving picture camera," plus two other still cameramen. A moving picture camera. Don't you just love it? Wonder if the fishing president would have used Twitter to tell the world of his accomplishment had he done it today. Next week: Harry S. Truman.